When it comes to the holidays, I am the stocking fairy. Robbie and I celebrate Christmas morning with family, and a few years ago, before our daughter was born, I decided to bring the stocking back. I had so much fun shopping for mini gifts for everyone, and everybody loved getting stockings as adults, so I made it a tradition. Last year was especially great because I got to fill a stocking with goodies for Essley's first Christmas. And I know this year will be even better because she'll be almost two and will actually get it. (I seriously get so excited thinking about it that I get chills. For real.) I honestly enjoy the process of shopping for and arranging stocking stuffers so much that it's become my absolute favorite part of holiday gift giving. Partly because I'm a design nerd and want the stocking to look nice, and partly because our family has an agreement to focus on giving small gifts that we'll actually use and appreciate, I tend to take my time and look for quality items versus grabbing quick items from the stores' stocking stuffer aisles (you know what I mean - those little plastic toys that break in minutes or weird holiday scented lip balms that end up in the garbage) in the days before Christmas. I tend to be a last minute shopper for bigger gifts, but I start purchasing stocking stuffer gifts around now every year. I've discovered that finding creative, fun, useful stocking stuffers isn't always easy, and it can also get expensive - so I make sure that I have plenty of time to find items that will truly be appreciated and to take advantage of sales and deals. I've done my stocking stuffer shopping both online and at stores over the years, but I recently discovered one place where I can do it all - CyberMonday.com. 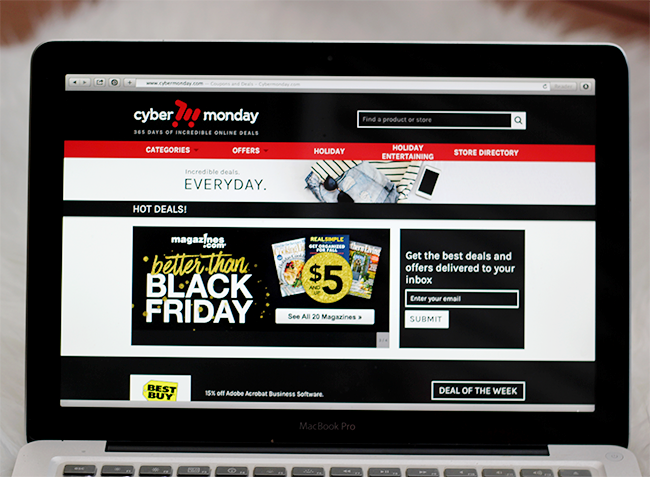 In case you're not familiar with them, they feature deals and special savings from hundreds of retailers - not only on Cyber Monday, but all year round. They collect coupon codes, limited time offers, and special saving opportunities from over 800 online stores, and put them all in one convenient place for you to use. It's pretty great. In addition to the fact that their extensive variety of retailers allows me to find gifts for everyone on my list, I don't have to deal with the stress of feeling like I need to rush around to different stores or a bunch of different websites to find the best deals. The other day after I was done with work, I sat down and got in the early Christmas spirt with a cup of tea and a couple of candy canes (my guiltiest pleasure when it comes to holiday sweets), and spent about an hour getting almost all of my stocking stuffer shopping done on CyberMonday.com. It's incredibly easy to use - I just browsed the offers and retailers (and did some searches for my favorite stores), and once I found deals that interested me, I clicked through to those stores' websites to place my order. My favorite part was that when I found an offer I wanted to take advantage of, I didn't need to dig around for it on the store's site. CyberMonday.com took me directly to the offer when I clicked through, so I was able to shop right away. In no time, I was able to find goodies for everyone and was able to either save money on every purchase I made or get some freebies. The first offer I came upon was for Toys 'R' Us, for free shipping on purchases of $19 or more. I got all sorts of goodies for Essley's stocking, including a Peppa Pig (current favorite) book, mini stuffed animal, and bath toys, and some small Sesame Street toys and coloring books, and I didn't have to pay a dime for shipping. Score! The next offer I took advantage of was from Sephora, where I was able to choose from four deluxe sample bags full of party favorites for free while getting my sister her favorite Urban Decay eye liner and some nail polishes for both her and my mom. Then I came across a killer coupon code for 20% off at Macy's, where I found a pair of running socks for my husband and some Godiva chocolates for everyone. I'm so excited to put together all of the stockings with the goodies I scored, and it was a nice feeling to know that I was able to purchase gifts that will be truly appreciated - while getting some fantastic deals in the process. 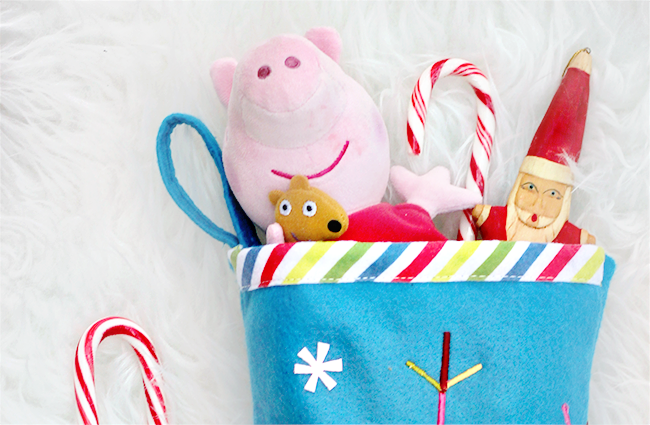 Who else loves putting together stockings for the holidays? 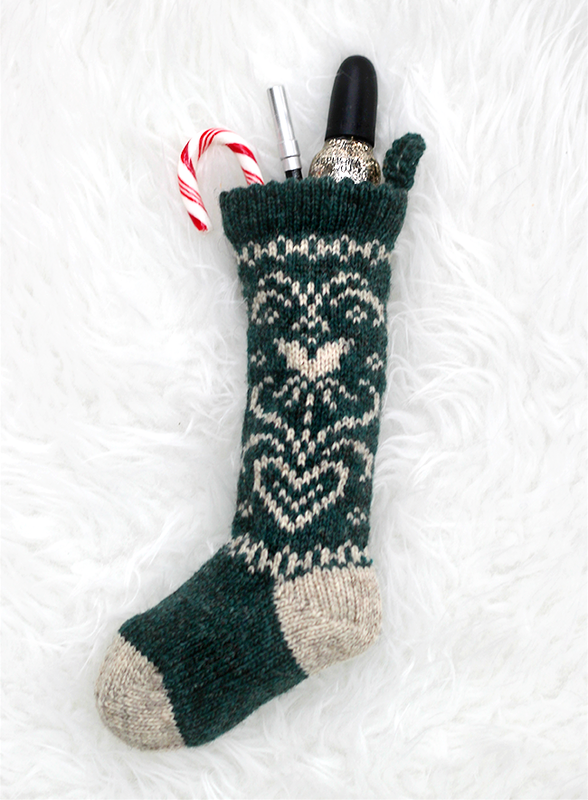 What are your favorite stocking stuffer gifts to give? Thank you for supporting the brands that make Bubby and Bean possible. I was selected for this opportunity as a member of Clever Girls and the content and opinions expressed here are all my own. We have St. Nicholas on the 6th of December where we gift little trinkets and put one of our shoes outside the door the evening before - the next day it is "miraculously" filled with chocolate ;-) I quite like this tradition! 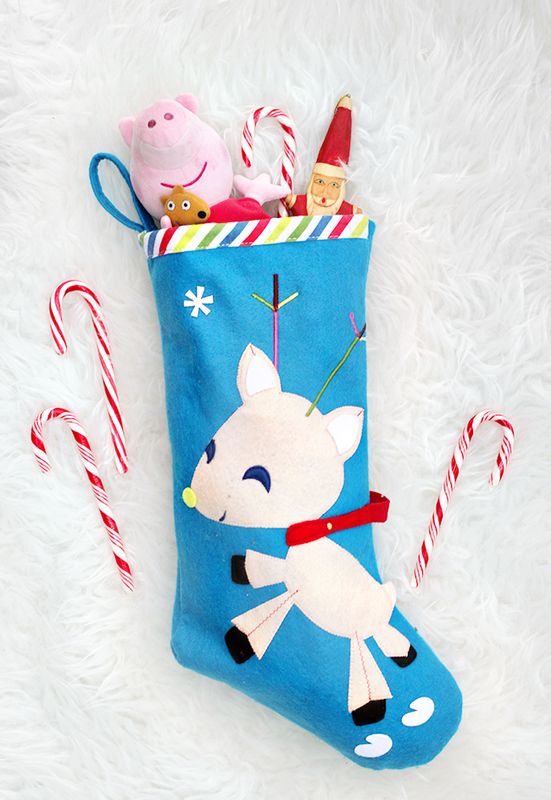 That stocking is so cute! We like to do this too!!! And stockings on Christmas haha!!!! What a fun tradition Duni! We may have to try that. Those stockings are both so cute!!! My mom still fills stockings for us haha! I love it! I loved this post Melissa!!! I love shopping for little gifts for people, but I am totally a sucker for the impulse buys at the register! I'm going to check out this website for sure! Thank you for the great post!!! In my family we've always done adult stockings - my parents are quite restrained when it comes to enjoying treats and it was always fun to see them get really excited on Christmas morning finding all kinds of sweets that they love in their stockings. My husband and I do the same thing now, but we've always added a bit of his family's tradition of adding practical items to our stockings - so now I usually receive both chocolates and a toothbrush on Christmas mornings, ha ha! Thanks for your comments you guys! I'll share our stockings on IG this year.